One dozen of the most elegant black magic roses in a tall glass vase. 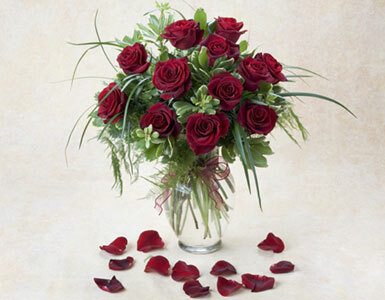 We create beautiful arrangements of red anniversary roses and offer dozen red roses, and vase of red roses for anniversary or any other occasion. We will have your dozen roses arranged and guarantee prompt delivery of your vase of red roses in Beverly Hills, West Hollywood, Santa Monica and greater Los Angeles area.